The the blue winged olives have started out on a regular basis. Each afternoon the bugs are emerging and fish have started to key on them. 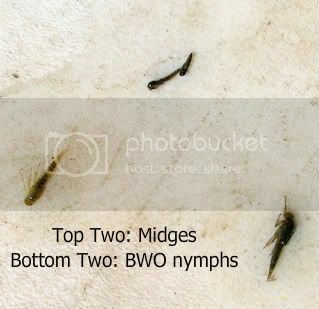 Most of the nymphs and emergers are dark olive, almost black, while the adults are more of a grayish olive. Adult BWO's are easily identifiable by there upright sailboat wings. Most of the adults have been around a size 16. They will slowly decrease in size as the hatch goes on. If it's a drizzly overcast day and there is a big hatch, adults as large as 14's will be present. Remember, the biggest hatches occur on the bad weather days. Oft times on sunny days the fish will key on emergers and nymphs instead of the adults. Good times and dancing lines. The Blue Winged Olives (baetis) are here. There seems to be more BWO's this year than the last couple. It is still early, but we are off to a great start. Here is a little more info about the hatch from a past blog. One of the most prolific hatches here on the the Green is the blue winged olives. Known as baetis, this little mayfly is of the upmost importance to the fish on this river. Coming out of the winter months the baetis bring a high volume of food the fish. If you catch a nice rainy or snowy day in April you will see the blue wings emerge by the millions. You can find runs, riffles, and flats with literally thousands of heads dimpling the water sipping in emergers, duns, and cripples. On a typical blue wing day I will fish virtually all the stages of the hatch. Starting with the nymphs, then to emergers, next is the duns and finishing with cripples (cripples work well during the hatch and when the spinners fall). As the hatch begins you can see the fish start to suspend up the water column. Keep adjusting to flies to depth of the fish. I have fished baetis nymphs anywhere from 1 to 9 feet given the conditions and where the fish are suspended. Baetis nymphs are excellent swimmers (prefering the dolphin kick) and move quickly in the water. They live along the slower edges and swim toward the main current as they emerge. Fishing back toward the shore and allowing the nymphs to swing off the bank can be a very effective way to catch fish. When the fish have reached the surface I like to fish a dun with a trailing emerger in the surface film. Once the hatch is in full bloom it's time to fish cripples. The fish key on the easy food (cripples), instead of snatching a dun that is trying to escape. Fishing a cripple and a dun or emerger together also works well. Cripples also work well when the spinner fall occurs. It is important to fish to fish, not water. When the fish will eat in rhythm and become selective. The more you get your fly over specific fish the better the chances of catching those fish. Your fly may be refused simply because it was not in rhythm. BWO's are a great chance to sight fish to some great fish. If you fish in the popular spots you will catch the fish that get caught a lot. Hatches like this give you the opportunity to catch fish that don't get caught. GO find them and your in for a treat!!! When the weather cools the fish start to change some of the habits. Eating streamers or eggs (even though there aren't any in the water) will become common. Nymphs that are red seem to work well as it gets colder. The fish will move into slower water. The fall blue wings (psuedos) will become more prolific. The rafts are gone, but more fishermen will show up. Cold fronts will come through with fishing being really good before the front and slow after the front. We should see some snow soon and the next day will be really hot again. There will be less terrestrials as the frost appears. Most days will be crisp in the morning and comfortable the rest of the day. There will be more orange than at a gators football game. Remember, be prepared for all different types of weather. Bring a softshell and a coat. I love fall. What a great time to be outdoors!! !